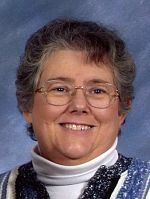 Sandra L. ‘Sandy’ Wolf of Plainwell, Michigan, passed away Saturday, May 5, 2012 at Wings Home in Allegan. Sandy was born April 13, 1950 in Kalamazoo to Charles and Jacqueline (Barnes) Austin and was a lifelong resident of the area. She was a graduate of Gull Lake High School. For 19 years she was employed as a cook with the Otsego Public Schools and then worked 10 years at Meijer. In her leisure time she enjoyed working Sudoku puzzles, trips to the casino and trips up north to the U.P. She had a love of butterflies and met regularly with co-workers as they had formed a ‘dessert group’. Sandy loved spending time with her grandson. On May 3, 1969 in Richland she married Fred Wolf, who died in 2008. Also preceding her in death were her father, Charles Austin, and her brother, Stanley Austin. Surviving are a daughter, Becky (Jake Hammond) Wolf of Otsego; a grandson, Chase Leonard of Otsego; her mother, Jacqueline Austin of Plainwell; a brother, Charlie (Mary Lou) Austin of Hickory Corners; three sisters-in-law, Carol (Larry) Wiessner of Delton, Sue McGowan of Lawrence and Sally (Leon) Thompson of Florala, Alabama; several nieces and nephews. In keeping with her wishes cremation has taken place. Friends may visit with Sandy’s family from 6 to 8 P.M. Wednesday at the Winkel Funeral Home, Otsego, where Memorial Services will be held at 11:00 A.M. on Thursday, funeral celebrant Bill Rose officiating. Burial of ashes will follow at Mountain Home Cemetery, Otsego. Contributions in memory of Sandy may be made to Wings Home.